I paid a visit to the Cone Hill Cemetery on my way up Cone Hill Road–I used to be able to run up this hill, but today just walking had my heart rate going. 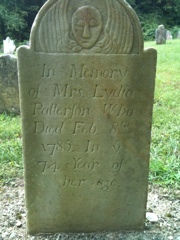 Some of the headstones in the cemetery were from 1799. The oldest one I found was from 1734! 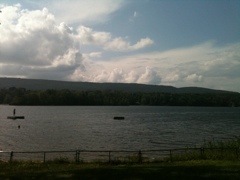 We swam in Lake Mahkeenac, otherwise known as the Stockbridge Bowl. The wind was blowing and the water was choppy, but I swam breast stroke for a good half hour.